The Duchess of Cambridge spent the day with her mother as the world awoke to the news that she is expecting her third child. A delighted Prince Harry today gave a thumbs up as he hailed the 'fantastic' announcement from the Duke and Duchess of Cambridge - who were forced to tell the world about the pregnancy early because Kate has again been struck down with severe morning sickness. 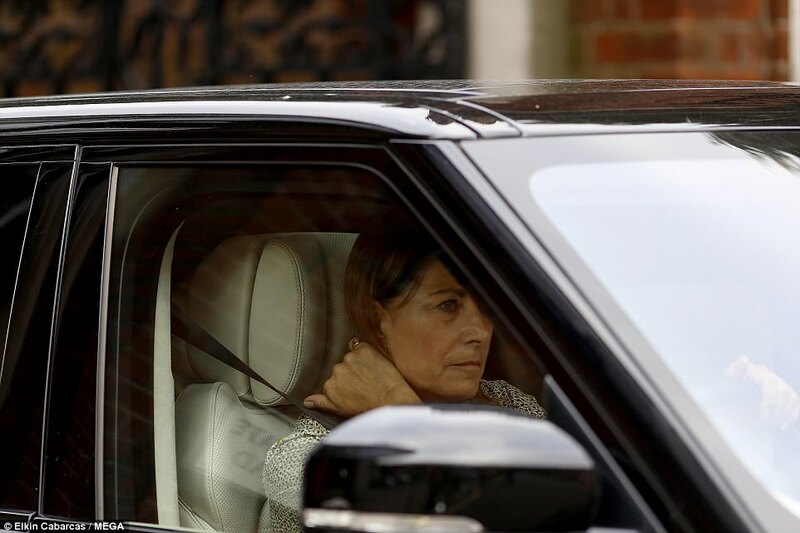 Kate's mother Carole Middleton was seen leaving Kensington Palace in a black Land Rover, where she had spent the day with her daughter, who is suffering with Hyperemesis Gravidarum. The Duchess, 35, who is believed to be between eight and 12 weeks pregnant, battled chronic morning sickness during her first two pregnancies and was hospitalised when expecting George in 2012. Today she was forced to miss her planned engagement at the Hornsey Road Children's Centre in London, and is being cared for at Kensington Palace. 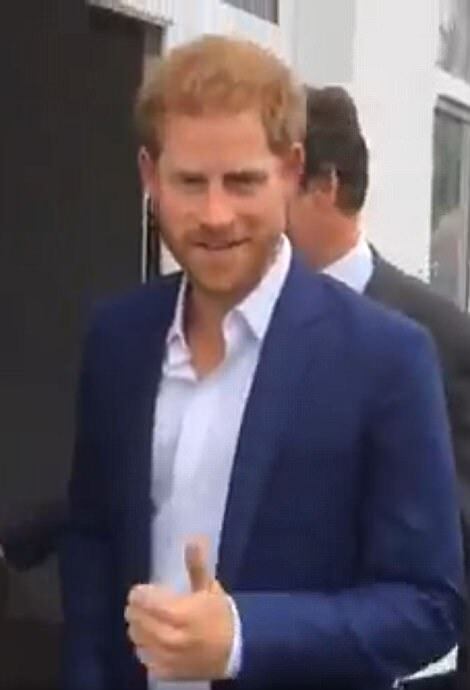 Harry was the first royal to comment publicly and said he was 'very, very happy’ for his brother William and his wife, adding that his sister-in-law was 'okay'. George, four, and Charlotte, two, will have a new sibling next April or May and the happy news was announced in a shock official statement, which said: 'Their Royal Highnesses The Duke and Duchess of Cambridge are very pleased to announce that The Duchess of Cambridge is expecting their third child'. 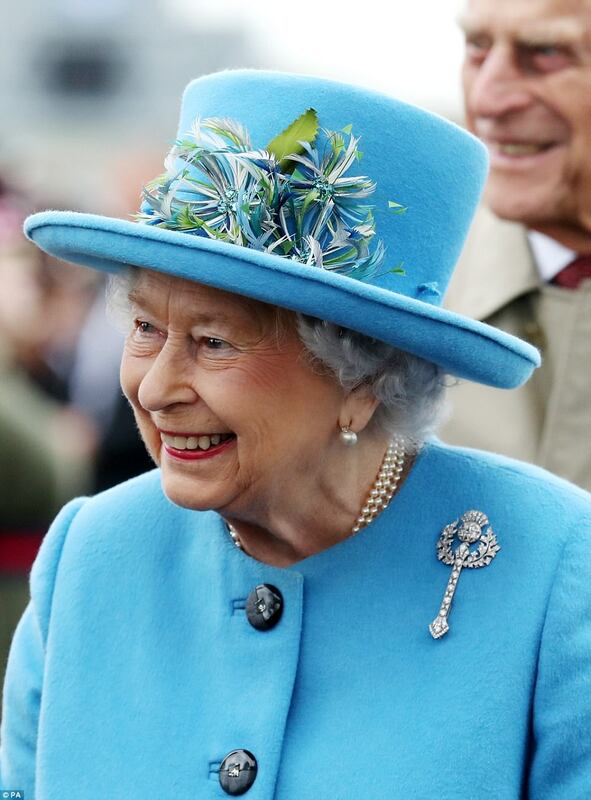 Her Majesty the Queen said she was 'delighted' to have a sixth great-grandchild and the baby will be born fifth in line to the throne, bumping uncle Harry into sixth place. 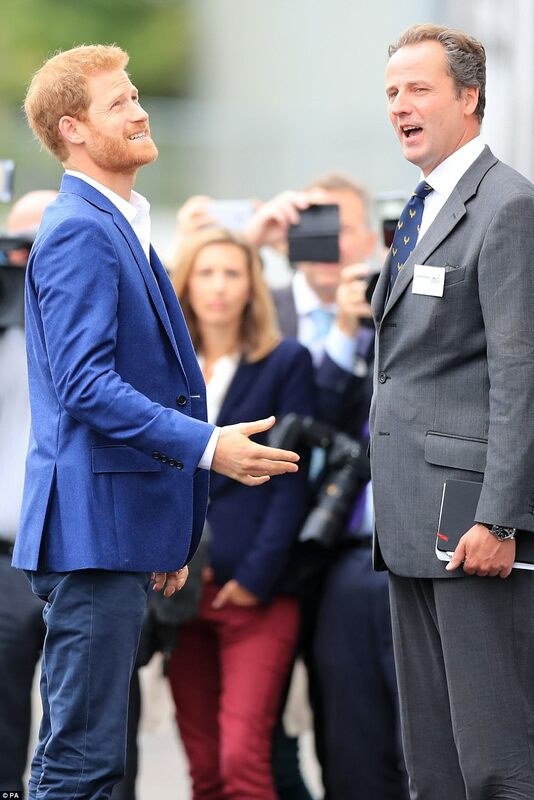 The Prince was in Manchester speaking to veterans and their families living in houses created by the BBC's hit DIY SOS show, and in a comical moment local plasterer David Masterton congratulated the Prince on 'your kid having a baby', to which Harry replied: 'Thanks very much' with a broad grin on his face. The race to guess the baby's name has already started with bookmakers saying Alice or Victoria are the clear favourites if it's a girl and Arthur or Albert are most likely of it's a boy. 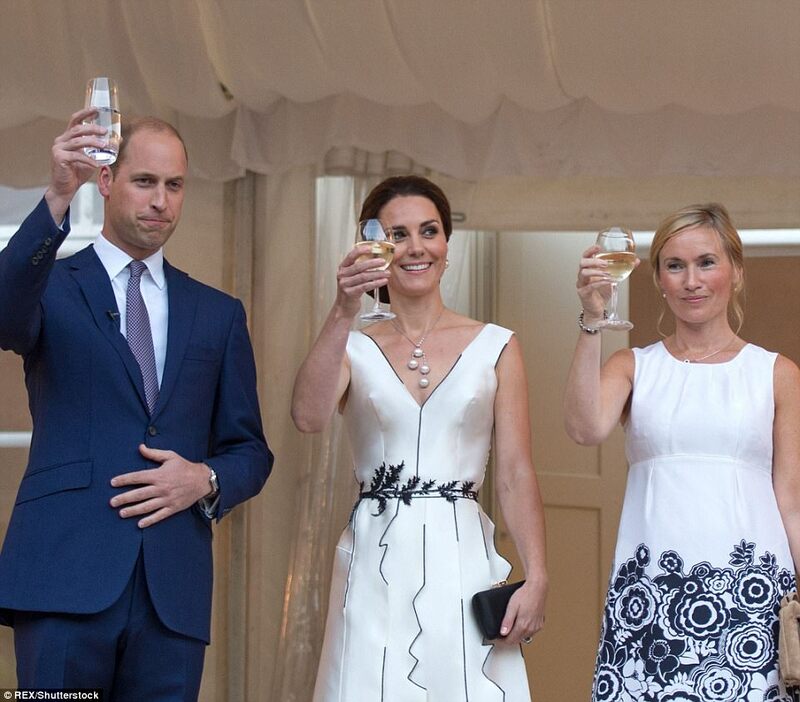 In July Kate hinted at a third child on a royal tour of Poland with her family. 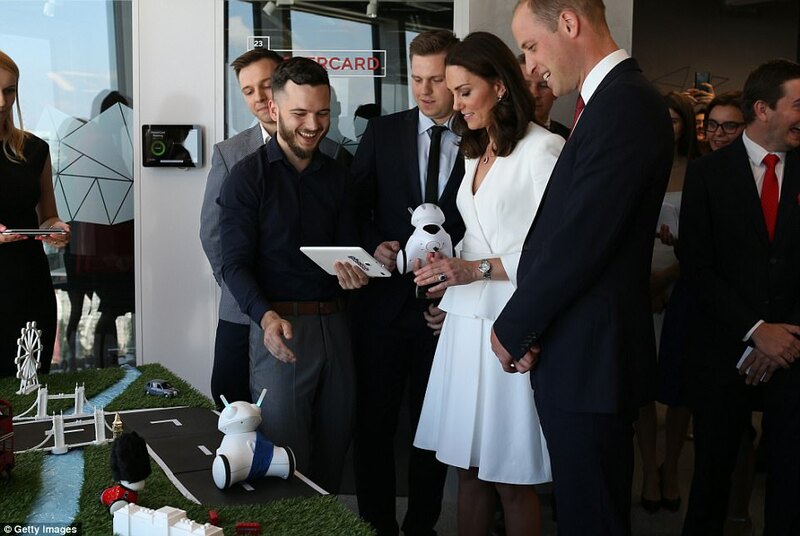 She was given a Whisbear cuddly toy meant for a newborn and said to William, laughing: 'We will just have to have more babies'. The Prince of Wales is first in line, followed by William, Prince George and the couple's daughter Princess Charlotte, who is two. 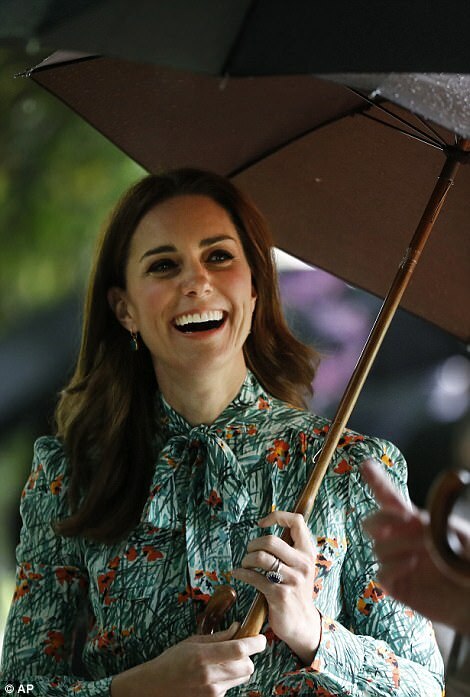 News of Kate's pregnancy began to leak out when photographers arriving early for her official engagement in London were told by staff that it had been unexpectedly cancelled at the last minute with no explanation. Hours later Kensington Palace confirmed rumours she was expecting again. 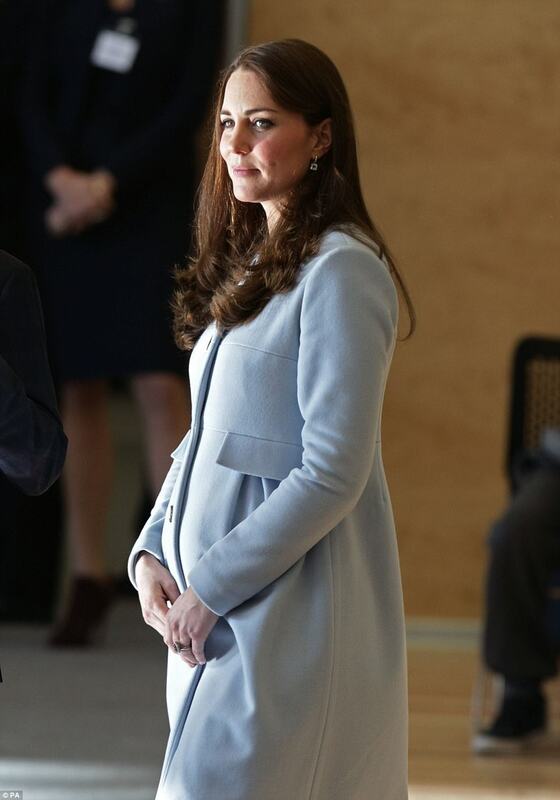 It's not known how far along in her third pregnancy the Duchess is, but while expecting Princess Charlotte she had to make the announcement prior to the crucial 12-week stage when severe morning sickness forced her to cancel engagements. The condition led to her being hospitalised during her first pregnancy. It is extremely unusual for the Duchess to cancel public engagements - she was pregnant and sick on the last few occasions. Hyperemesis gravidarum is common, affecting around 15 per cent of all pregnancies. However in its extreme form - where a pregnant woman is admitted to hospital or suffers the condition throughout her pregnancy - it is much more rare. It is much more serious than the nausea commonly experienced by expectant mothers. The condition is thought to be caused by elevated levels of 'pregnancy hormone' HCG, or human chorionic gonadotropin, which increases after conception. 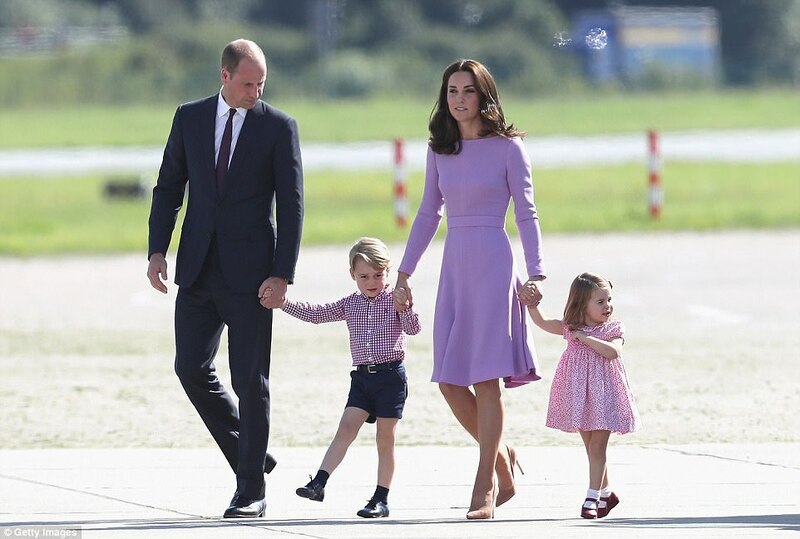 The couple have two children, Prince George, four, and two-year-old Princess Charlotte. 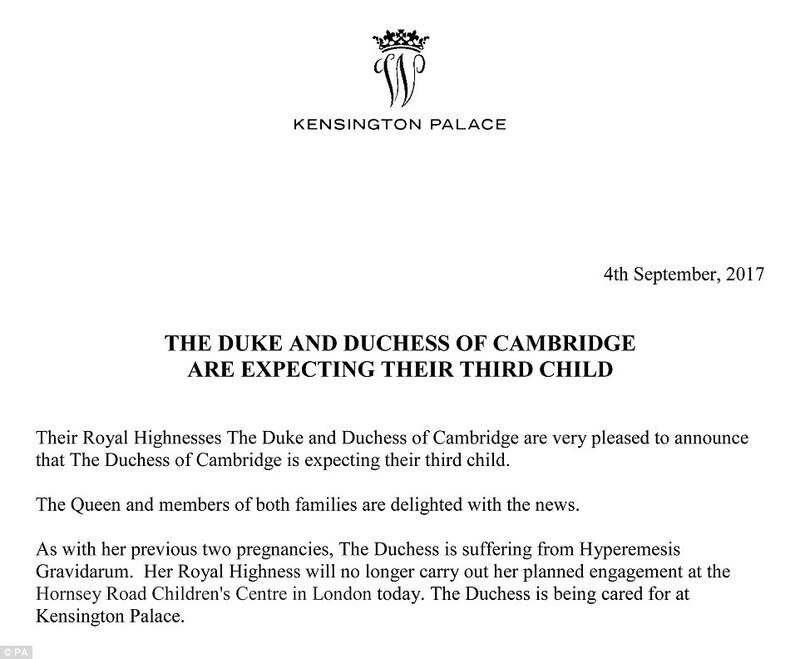 And the Duchess' uncle Gary Goldsmith has rushed to express his congratulations for the new arrival. The royal couple already have a live-in nanny to care for George and Charlotte and there is speculation that Maria Teresa Turrion Borrallo could be joined by a second full-time nanny. Kate has had both children at the exclusive Lindo Wing attached to St Mary's Hospital, Paddington and after two successful deliveries she is more than likely to return there in April or May. William was born there in 1982 when his mother Diana gave birth for the first time. There was a 23-strong team working to help the Duchess give birth in 2013 and 2015. Marcus Setchell delayed his retirement after the Duke and Duchess of Cambridge asked him to oversee the birth of their first child, the third-in-line to the throne. Jill Dando's fiance when she was murdered, Alan Farthing, 54, now the Surgeon Gynaecologist to the Royal Household after Mr Setchell finished work, is likely to deliver the royal couple's third child. 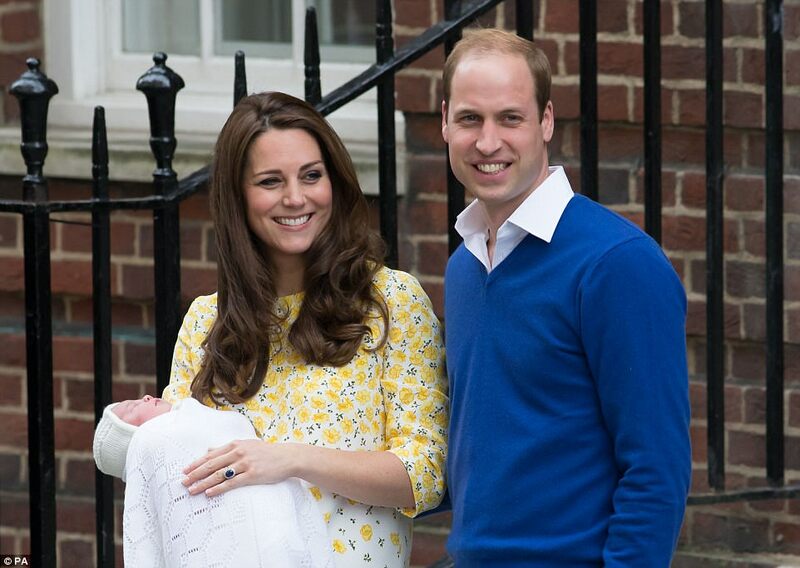 Kate has made no secret of her desire for a third child, confiding how broody she feels on several occasions. 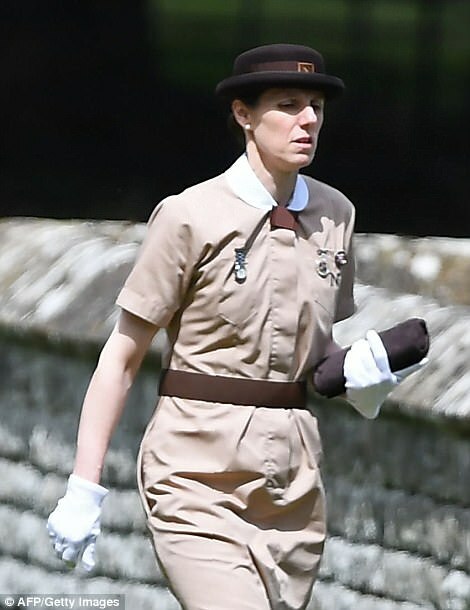 She is one of three and had a happy home life with her sister, Pippa Matthews, and brother, James Middleton, and is close to both of her siblings. By having more than two offspring, William and Kate are following in the footsteps of the Queen and the Duke of Edinburgh, who went on to have four children - although there was a gap of 10 years between their second child, Anne, and third, Andrew. An age gap of less than two years between Prince George and Princess Charlotte gave Kate enough time to try for a third before she reached her late 30s, when women's fertility starts to decline more rapidly. But William - who is one of two siblings - may have needed more convincing. On an overseas tour to Singapore in 2012, when he was asked by a group of teenagers how many children he would like to have, he said he was 'thinking about having two'. The couple talked openly of having a family when they announced their engagement and planned ahead by saving the top of their wedding cake - traditionally served at the christening of a first-born. The news was announced as the royal couple were preparing to send their eldest child, Prince George, off to school for the first time on Thursday. But she could miss the school start if she remains too unwell to leave Kensington Palace. 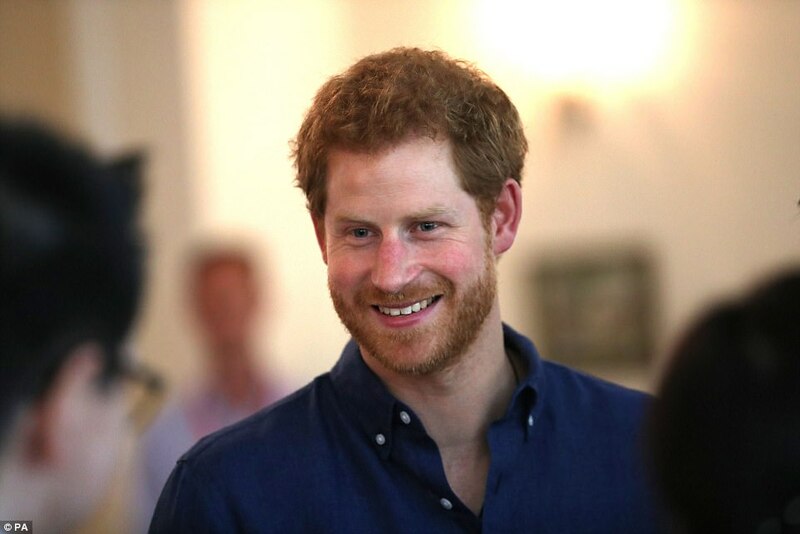 Thomas's Battersea will welcome the young prince and his parents on Thursday. 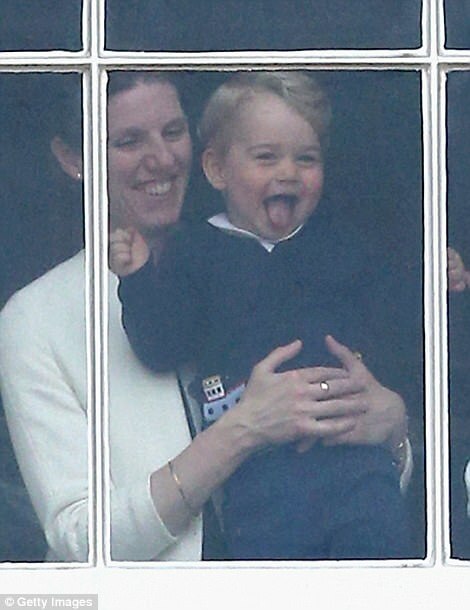 George's first day at school will also mark a new chapter for the Cambridges as they are now mainly based in their Kensington Palace apartment rather than their Norfolk home Anmer Hall. 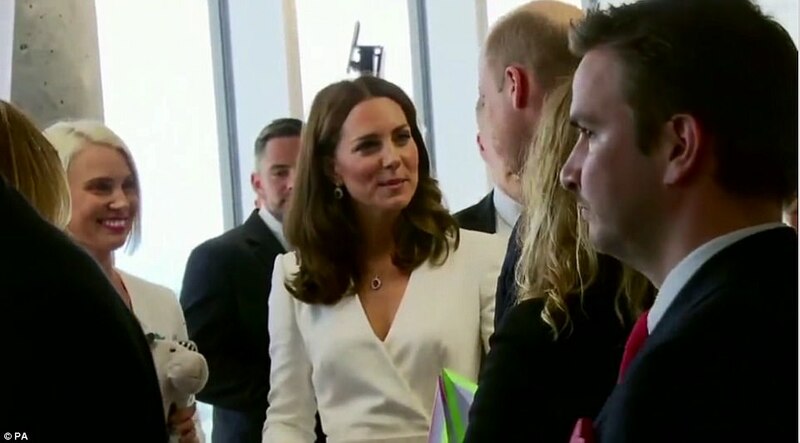 Kate had been due to visit the Hornsey Road Children's Centre in London to hear about the mental health impact of becoming a mother. Kensington Palace visitors were delighted that Prince William and Kate Middleton, the Duchess of Cambridge, are expecting their third child. 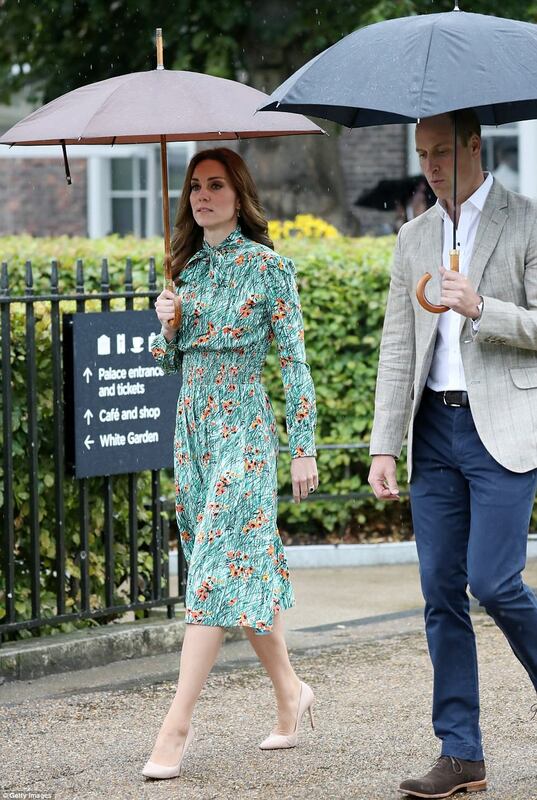 A brief appearance of an ambulance made some concerned the Duchess was being taken to hospital but it later emerged a visitor had fallen ill in the gardens. Caroline Hughes, 62, from Lancaster, said she heard about the announcement as she was travelling to visit the palace gardens with her husband. She said: 'We literally heard the news just before we came and we're delighted for William and Kate. 'They're such a lovely couple, we always keep an eye on what they're doing, so to be visiting London today makes it extra special. 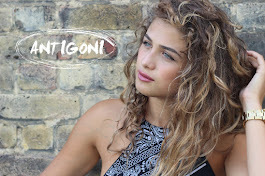 'We'd heard she's suffering with bad morning sickness and obviously hope she's okay and wish her all the best. Alice Walsh, 41, from Dorking in Surrey, said: 'I'm delighted for them. 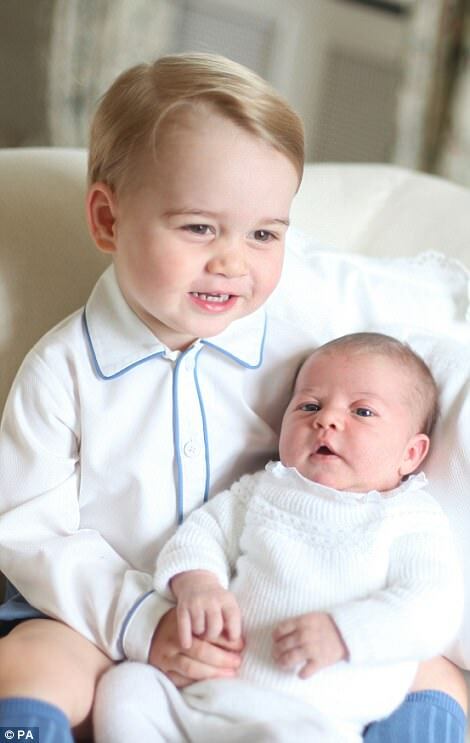 'George and Charlotte are adorable and it's so lovely they'll have another little brother or sister. 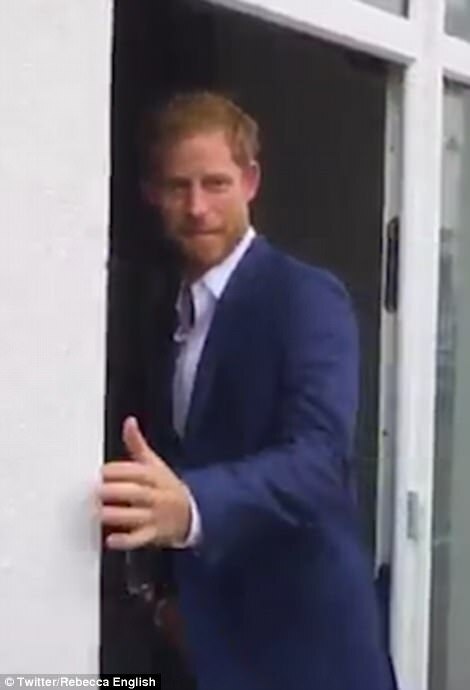 'The Royal Family are great for this country and Prince William and Kate are such good representatives, it means a lot to be here today with the announcement being made. The Duchess of Cambridge today announced she is expecting her third child - two months after joking with Prince William that they will 'have to have more babies'. 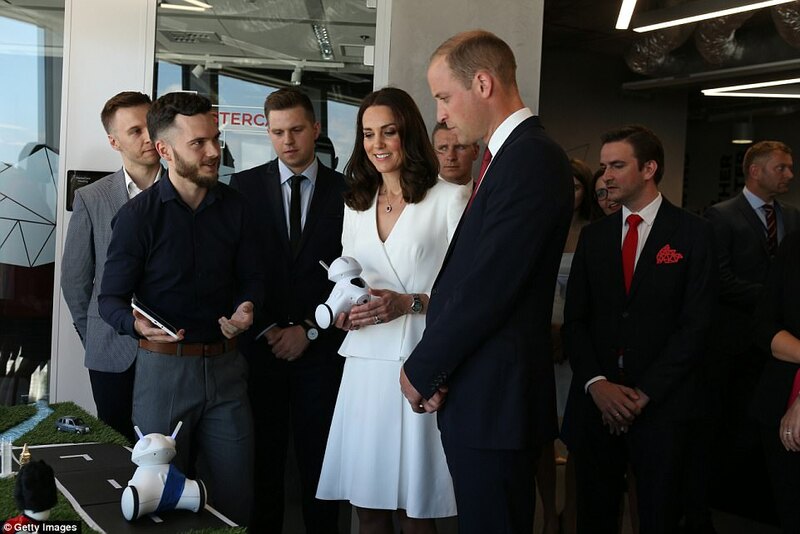 The 35-year-old was on a royal tour of Poland when she was given a cuddly toy designed for newborns. The soft toys are designed by Whisbear and are supposed to comfort newborns by mirroring the sounds from the womb. She speculated about having another child during a reception in Warsaw - just hours before she donned a dazzling ivory gown for a garden party in the Queen's honour. 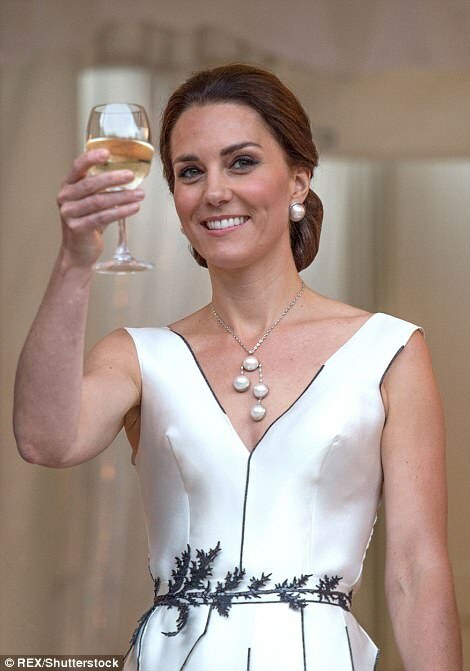 Kate attended the event with her husband and was photographed barely touching her glass of wine. 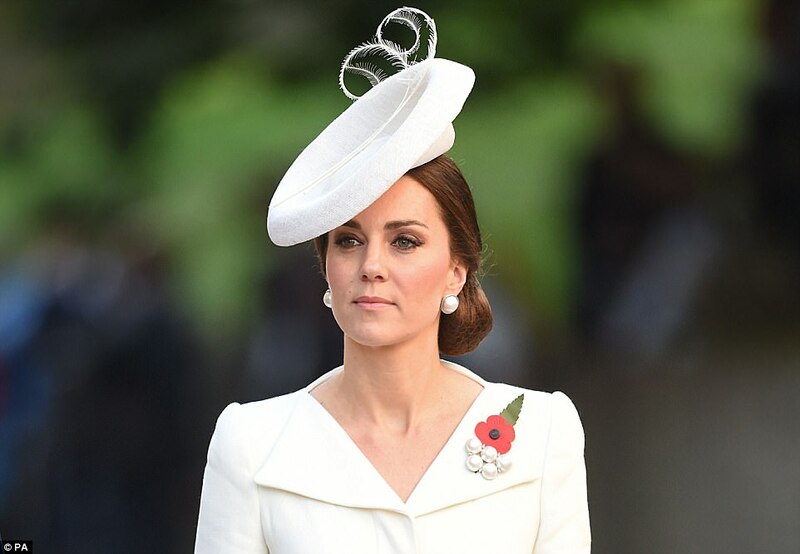 Julia Sielicka-Jastrzebska, who founded the company with her sister, said Kate made the joke after learning the bears were designed for children younger than George, three and Charlotte, four. 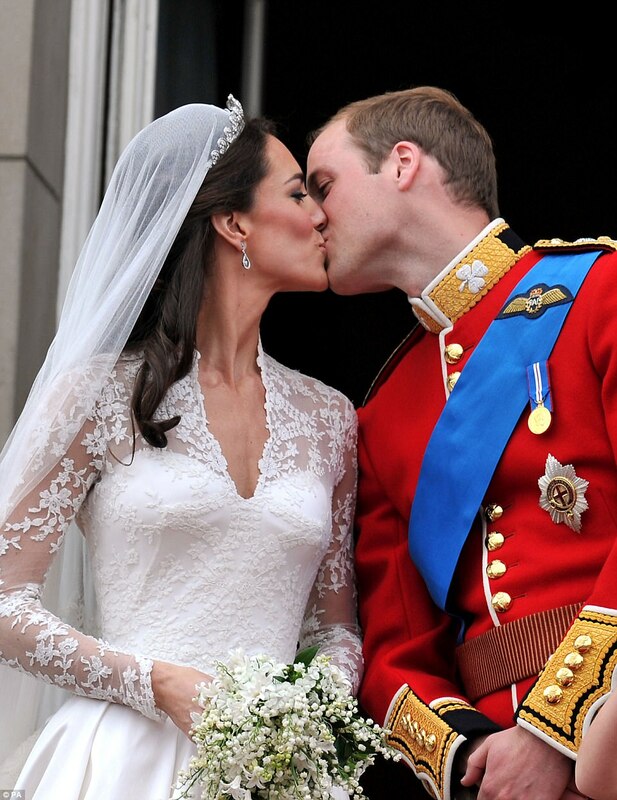 Kensington Palace today announced the royal couple are expecting their third child together. The Duchess, who is believed to be between eight and 12 weeks pregnant, battled Hyperemesis Gravidarum during her first two pregnancies and was hospitalised when expecting George in 2012. 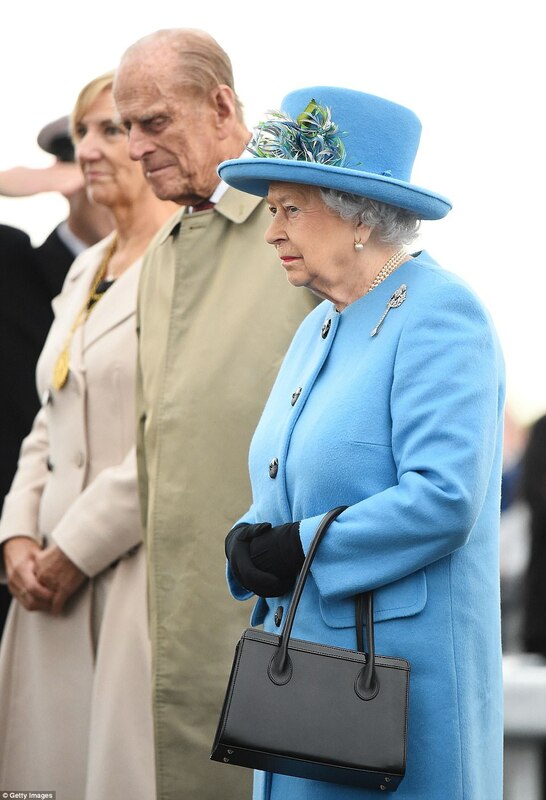 The Queen has officially opened the UK's tallest bridge in a special ceremony, just hours after Kensington Palace announced the news of a new royal baby. 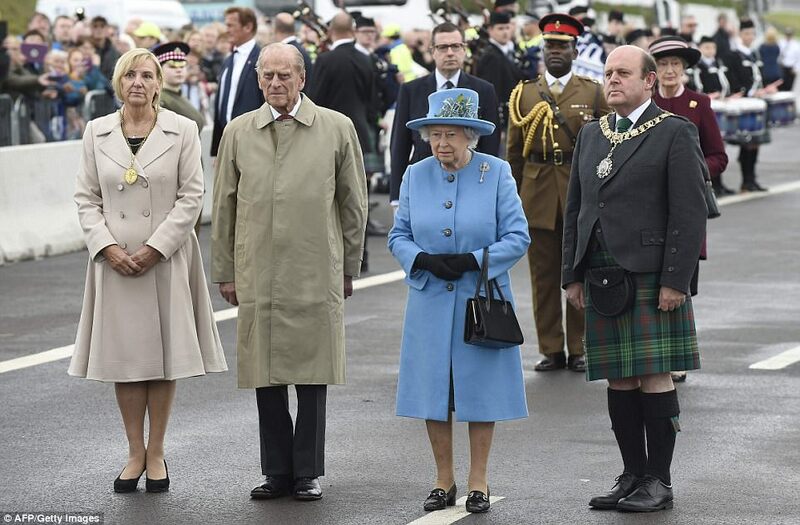 The monarch, accompanied by the Duke of Edinburgh, cut a ribbon to signify the formal opening of the new Queensferry Crossing across the Firth of Forth. 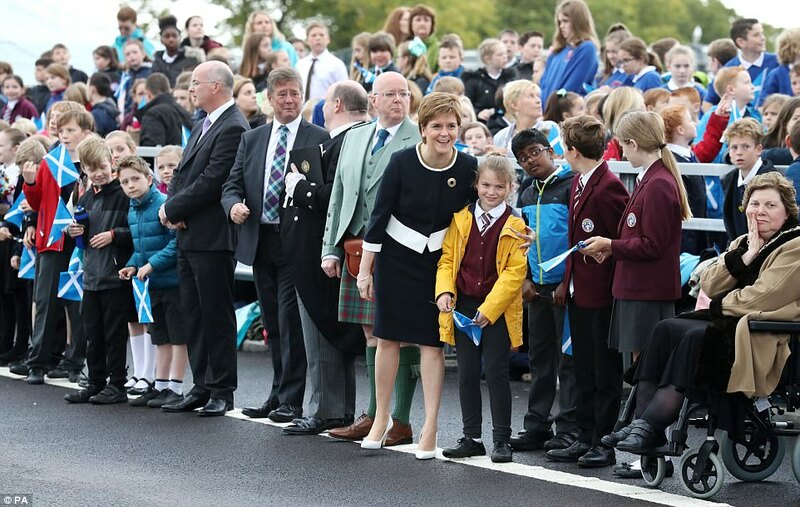 Hundreds of people, mainly schoolchildren, cheered as the Queen cut the ribbon on the south side of the bridge after the royal couple met First Minister Nicola Sturgeon, constructors' representatives and local officials. The bridge was also blessed by Church of Scotland Moderator The Right Rev Dr Derek Browning. Kensington Palace this morning announced that the Duke and Duchess of Cambridge are expecting a third child - adding that the Queen and other members of the royal family were 'delighted' at the news. 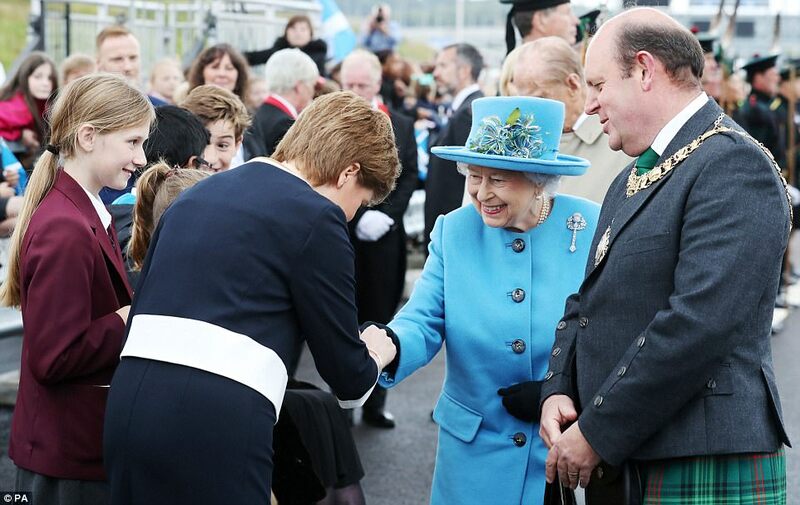 Today's event to unveil the £1.35 billion crossing after six years of construction work is taking place exactly 53 years on from the day when the monarch opened the neighbouring Forth Road Bridge. 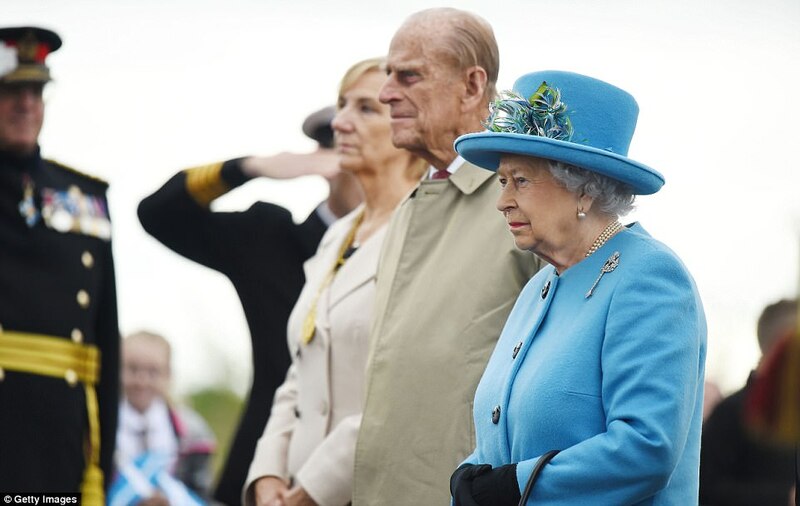 Philip, 96, bid farewell to his own royal jobs at Buckingham Palace at the start of August but officials stressed that he may still accompany the Queen at her events from time to time. 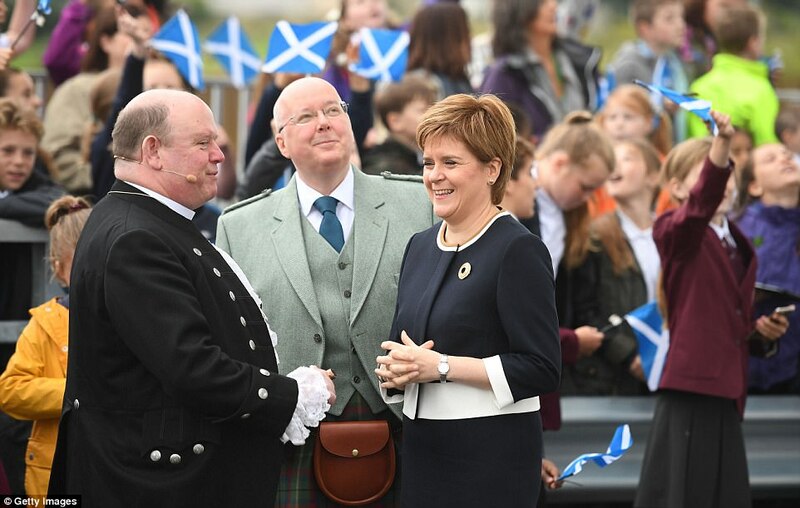 Speaking earlier about the ceremony, Ms Sturgeon said: 'Importantly, this celebratory event will recognise the thousands of people who have been involved in the construction of the new bridge. The rare pregnancy condition which the Duchess of Cambridge suffers from can be deadly, medical literature shows. Hyperemesis Gravidarum (HG), which strikes just 1 per cent of pregnancies, is a complication that causes excessive nausea and vomiting. Unlike regular morning sickness, it doesn't fade away with time. It is also considered to be the second leading cause of hospitalisation during pregnancy. More than 1,000 abortions each year are linked to the severe pregnancy sickness - which can leave some women bedbound. Some pregnant women are sick many times a day and are unable to keep food or drink down, which can have a negative effect on their daily life. Many mothers-to-be may lose up to 10 per cent of their body weight when they are supposed to be gaining about 1lb a week. This can trigger a build-up of toxins in the blood or urine known as ketosis as the body tries to compensate for lack of food. Signs and symptoms of HG include prolonged and severe nausea and vomiting, dehydration, low blood pressure and rapid weight loss. Hospital treatment for these women is essential, as without intravenous feeding and fluids they are at risk of becoming dangerously dehydrated. Until intravenous hydration was introduced in the 1950s, it was the leading cause of maternal death, Marlena Schoenberg Fejzo, a medicine researcher at the University of California, Los Angeles, previously told The Conversation. Could her extreme morning sickness mean Kate is going to have another girl? Last year, researchers found those with extreme morning sickness are slightly more likely to have girls. According to New Scientist, one theory is the Trivers-Willard hypothesis which suggests when there is a lack of nausea it could be a son. However, in tough times, a daughter is safer for a mother to pass on her genes to as weaker males are less likely to succeed. Given a third of pregnancies with HG result in miscarriage, this could help to explain why fewer boys are born to women with the condition, the study said. But she warned that the condition is neither well-understood nor well-known, even with the 'flurry of headlines' after it was announced Kate was struck down by it. The condition can also affect the baby's development and there is a risk it will be premature or have a very low birth weight. In severe cases, the sickness can trigger a miscarriage. It can also cause an abnormally fast heart rate in the mother, medical literature states. 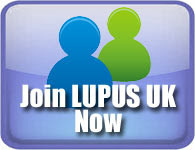 There is no cure but one of the most effective treatments is the drug Ondansetron, which is taken twice a day at a cost of £3.50 per pill. The Duchess, 33, cancelled engagements last autumn as she battled HG. 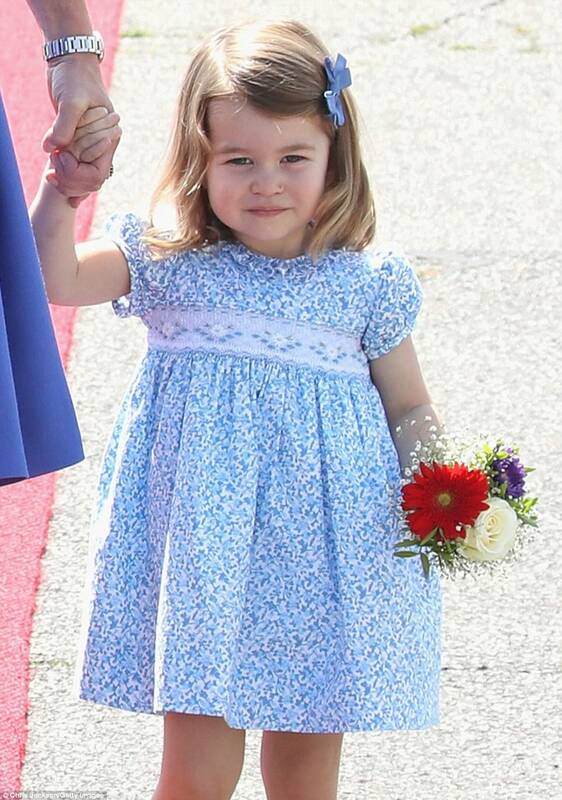 And in 2012, while expecting Prince George, she was admitted to hospital when HG left her severely dehydrated. Duchess of Cambridge's third pregnancy means a sibling for George and Charlotte is set to arrive in late April – but what will the newest family member be called? The Duchess of Cambridge is pregnant with her third child, a sibling for Prince George and Princess Charlotte - but when will the latest family member arrive? While most parents don't announced the happy news until the crucial 12-week stage, the Duchess is suffering from Hyperemesis Gravidarum, or severe morning sickness, a condition that is usually detected around the six-week mark. When pregnant with Princess Charlotte, Kate had to announce the news early after the condition forced her to pull out of planned engagements and today's announcement from Kensington Palace came as she cancelled a planned visit to a children's charity in London this afternoon. Presuming Kate is around six to eight weeks pregnant' the new arrival can be expected in late April or early the following month, around the time of Princess Charlotte's birthday on May 2. The couple will also be busy considering baby names in the next months, with Alice and Victoria the most popular choices for a girl and Arthur and Alexander the favourites for a boy. 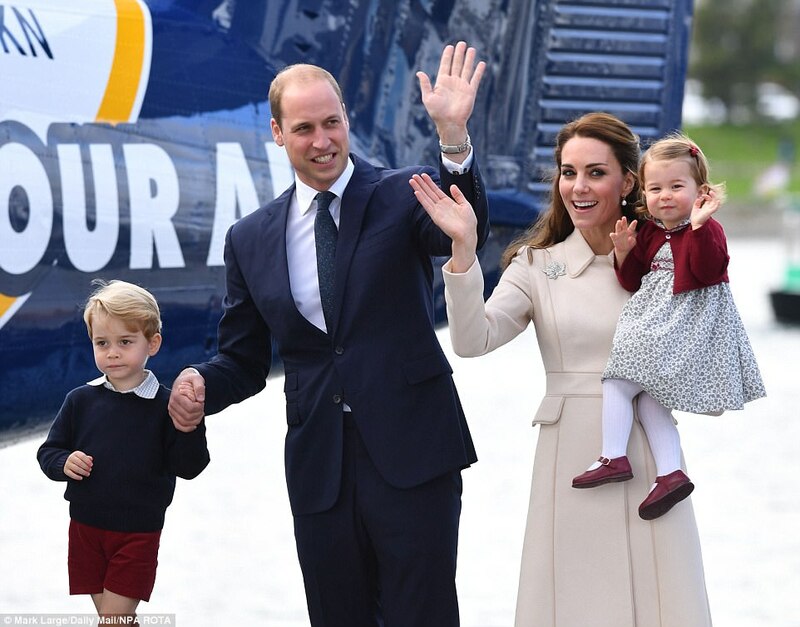 Bookies Ladbrokes are already taking bets on the new arrival, making it even money George and Charlotte are joined by a sister, and the same price is on offer for a brother. If it's a girl, Alice is the favourite name while Arthur tops the charts for a boy. It's likely the couple will choose a name with some kind of royal significance. But as the new baby will be fifth in line to the throne there's no pressure to name them after a past monarch like big brother and future king, Prince George. The birth of Duchess of Cambridge's third baby will mean that Prince Harry will become sixth in line to the throne, while Princess Charlotte will remain fourth in line. 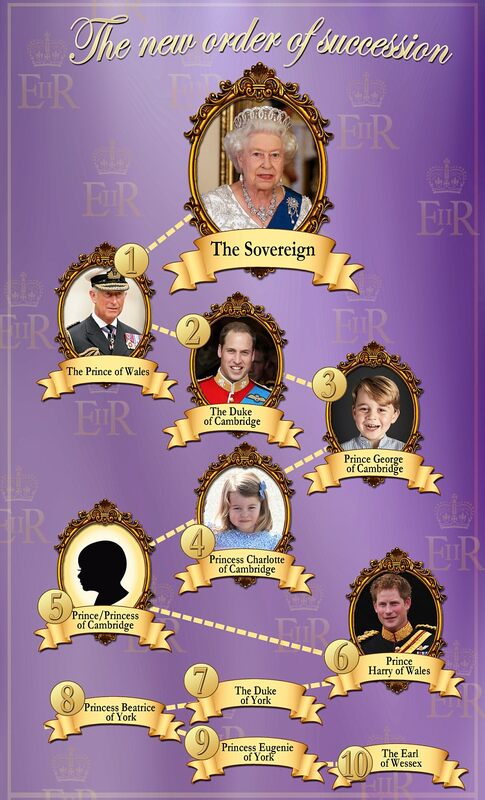 The current order of succession is Prince Charles, Prince William, Prince George, followed by Charlotte and Harry. A law change in 2013 before the birth of George means that male members of the royal family no longer overtake their sisters in the line of succession. This means that Charlotte will remain as fourth in line to the throne, regardless of whether the new baby is a boy or a girl. The Royal Succession bill was rushed through Parliament following the announcement that Kate was pregnant with her first child in 2012. The law change was made to ensure that William and Kate's first child could succeed to the throne, regardless if the baby was a boy or a girl. The Succession to the Crown Act 2013 altered the laws of succession. It replaced male-preference to allow the eldest child, regardless of gender, to precede their siblings. The act also ended the disqualification of a person who married a Roman Catholic from the line of succession, and removed the requirement of those outside the first six persons in line to the throne to seek the Sovereign's approval to marry. 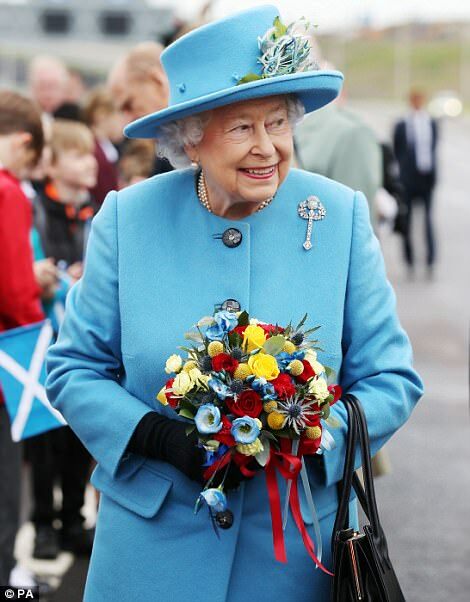 It was brought in accordance with the 2011 Perth Agreement - made by the prime ministers of the 16 Commonwealth realms. 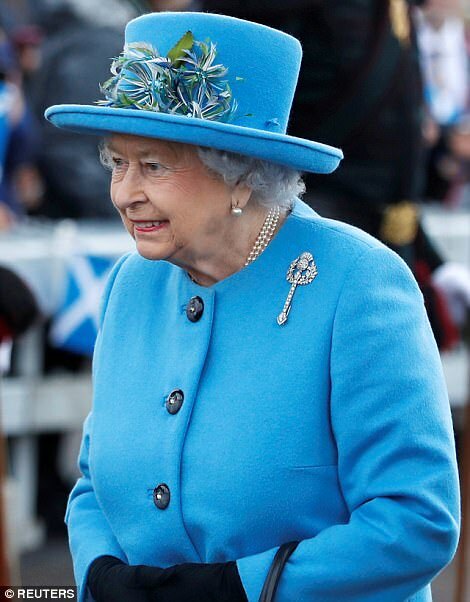 The Succession to the Crown Act 2013 was brought in accordance with the 2011 Perth Agreement, which was signed off by prime ministers of the 16 Commonwealth realms. 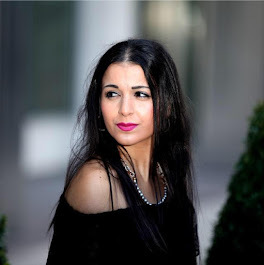 The act also ended the disqualification of a person who married a Roman Catholic from the line of succession, and removed the need for those outside the first six persons in line to the throne to seek the monarch's approval to marry. There had been fears there could be a constitutional crisis if Kate and William had a baby girl before the law was changed. 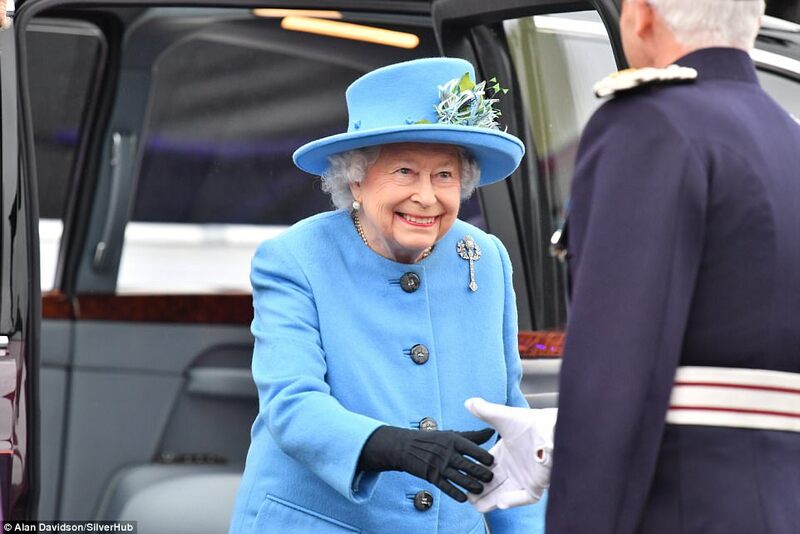 But the Queen approved the historic change by giving royal assent to the Succession to the Crown Act in April 2013, before the birth of George in July. Under the ancient rules of male primogeniture, first born royal daughters in direct line to the throne were overtaken by younger male siblings. However, the law was widely criticised and viewed as outdated and discriminatory. The scrapped law of male primogeniture only allowed Elizabeth II to become Queen because she did not have any brothers. The change in succession rules is not retrospective, so the Princess Anne did not jump ahead of her younger brothers Prince Andrew and Prince Edward. 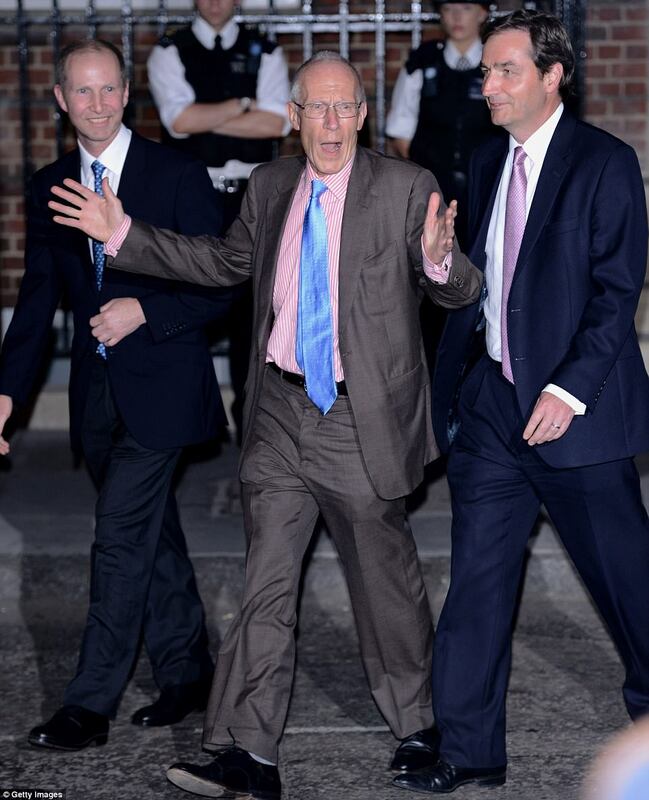 After Harry in the line of succession is Andrew, followed by his daughters princesses Beatrice and Eugenie. This morning's announcement of a third baby for the Duke and Duchess of Cambridge has pushed Harry out of the top five in the line of succession, making him sixth in line to the throne. But it was business as usual for the Prince this morning, who looked in great spirits as he arrived in Manchester for a day of engagements. 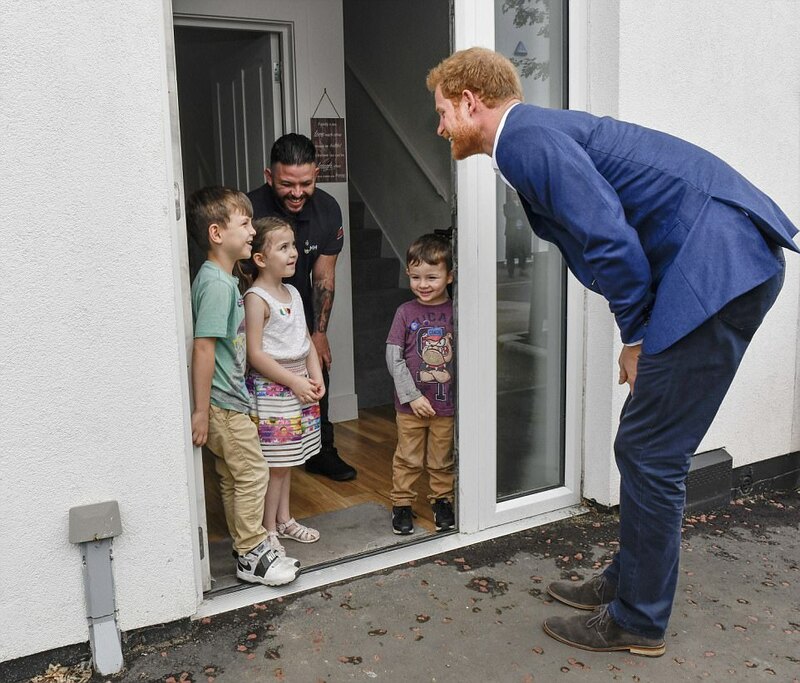 The visit begins with a return to Canada Street in Newton Heath, which he visited two years ago as part of the BBC's DIY SOS project, to redevelop derelict homes for ex-service personnel. 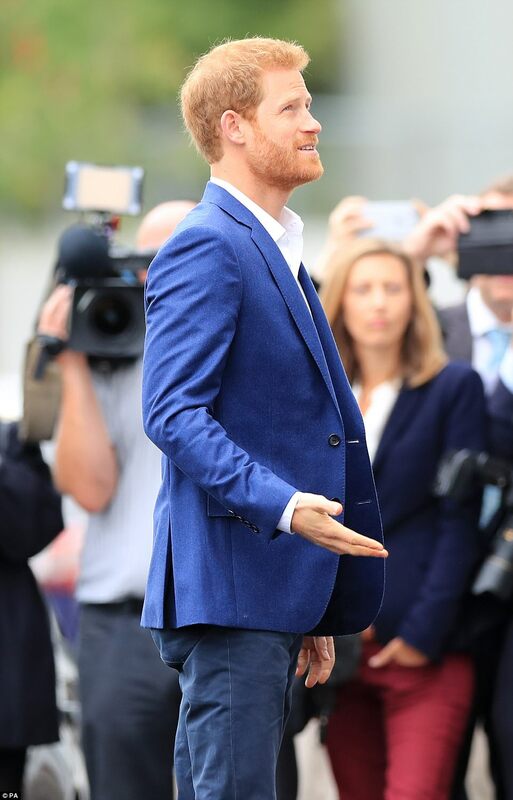 Prince Harry is visiting Manchester today to see health workers helping those affected by the terror attack on the city. 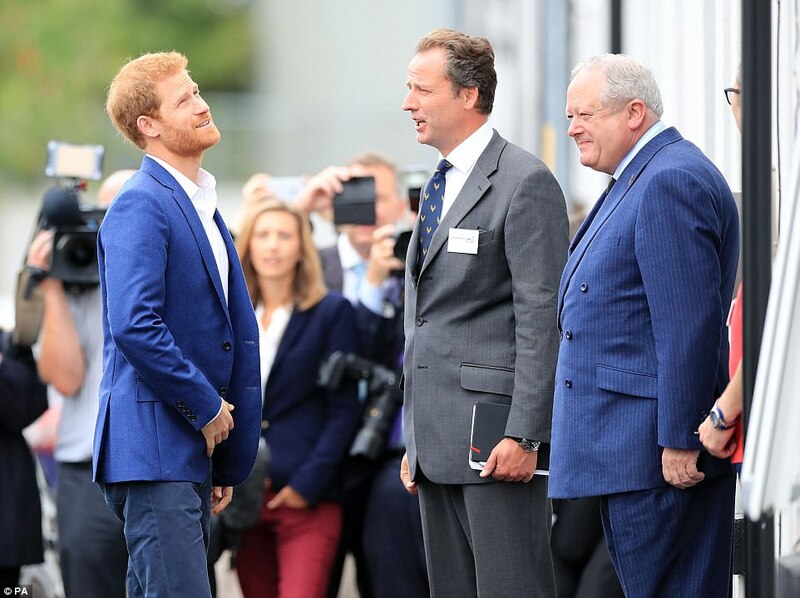 Harry will visit the NHS Manchester Resilience Hub, set up as a dedicated mental health service for those affected by the suicide bombing of Manchester Arena on May 22 which left 22 dead and scores injured. Later he will travel across the city to Manchester City Football Club to drop in on a training session with local schoolchildren given by apprentice sports coaches. His last engagement will be to attend a reception hosted by the Rugby Football League (RFL), where he will meet members of the England squad, as well as coaches such as Kevin Sinfield, Jamie Peacock, Denis Betts and Paul Sculthorpe along with support staff as they prepare for the World Cup in Australia and New Zealand this autumn.